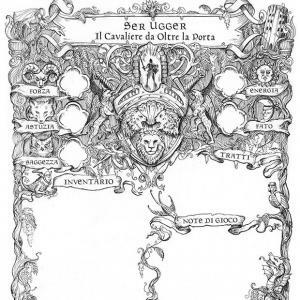 Kata Kumbas (KK) is probably the oldest Italian RPG, published in 1982 by Massimo Senzacqua and Agostino Carrocci. Its name means, in ancient Greek, “near the caverns” and it is a fantasy game, set in an alternate Medieval Italy, in a country called Laìtia (an anagram of “Italia”). Light-hearted in tone, it is infused with classical culture. If you have ever seen the movie Brancaleone or read The Name of the Rose, well, you know what Kata Kumbas is about. In 2015 Kata Kumbas was published again in Italy, totally reworked and redesigned, as a Savage Worlds setting. deadly riddles? Or perhaps you prefer finding a way to beat all other suitors of Countess Morbidella, an enormously rich widow, and marry her despite the rumors of her incredible appetites? Or, alternatively, join Friar Ricino in his rag-tag crusade against the Threat from Beyond the Sea, looking for riches, glory and beautiful women? Be ready, because adventure takes a number of forms in Laìtia, some of them merry and sensual, others simply deadly! The main theme of KK is that you play as yourself; connecting Earth and Rarte (the alternative Earth where KK takes place) there are magical Gates, through which people like you and me can pass. Visitors to Laìtia are welcomed by Gate Keepers, who cast upon them the Integration Spell, a special magic which “transforms” them into Laìtians, granting them the capacity to speak the local tongue, and making them knights, alchemists, rogues and soon, but keeping the memories and the identity of the player. These types of characters are called Integrated Ones.